The Carlson Commercial and Industrial Services Team is committed to the highest standard of customer satisfaction. As leaders in the commercial and industrial painting industry, we continue to build upon a long tradition of integrity, excellence, and profitable growth. We maintain our competitive advantage by developing innovative solutions to unique problems. We proudly employ only Certified Journeypersons and registered Apprentices who are fully trained and qualified in all methods of painting and decorating. We have a strong commitment to ongoing education in painting techniques as well as environmental and workplace safety issues. 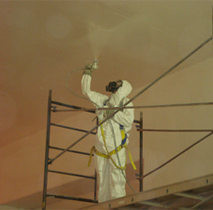 Our tradespersons are expert brush, roller, airless spray and conventional spray applicators.